Timeless Love-(Jim Hedgecock-2015)-Tall Bearded Iris-29 Inches Tall-Medium Bloom Season-Ruffled and lightly laced standards are pale blue with medium blue striations and veins at midribs. 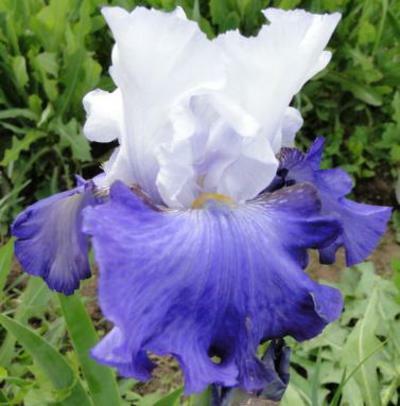 Falls are bubble ruffled medium blue with near white flushes at the beards. Beards are violet turning yellow in the throat. One of Jim's best ever bicolors.